I had always planned the ‘The Queen’s Centurion’ as a distant sister to ‘The Ghost Swift’. Both were guardians of keys separated at birth and banished to the distant outreaches of Wonderland. I deliberately intended their pictures to communicate this relationship by echoing the design of their bodices and the way both characters were encased like waxen dolls in shrines. 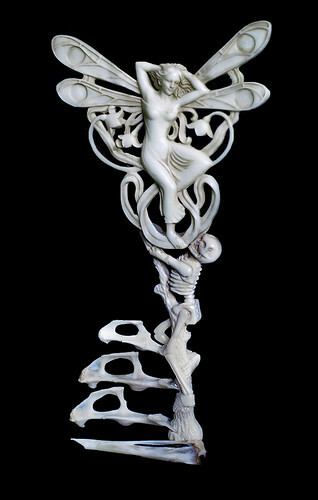 The Centurion’s only purpose was to protect the White Queen’s key which lay embedded deep in her chest. I felt strangely sad for this glassy eyed automaton, who waited patiently, imprisoned by the twisted tree roots that dripped with the possibility of a hundred alternative keys, each designed to distract whoever came upon her. In my dreams I imagined Katie would discover her, momentarily bringing life and warmth to the Centurion but would inevitably choose the Queen’s key, leaving nothing more than an overwhelming emptiness and a gapping hole in her heart. In all honesty creating these pictures was a strange mix of emotions for me, at time when I was struggling a great deal. It was the 4 year anniversary of losing my mother, something which is painfully obvious to every time I look back at them. There is a hopelessness and a sense of loss that I cannot avoid, their meaning left a little blurred – it is just the way they came to be. Despite how I was feeling, the Centurion’s costume became one of my favourite pieces and something I took an enormous amount of care over. 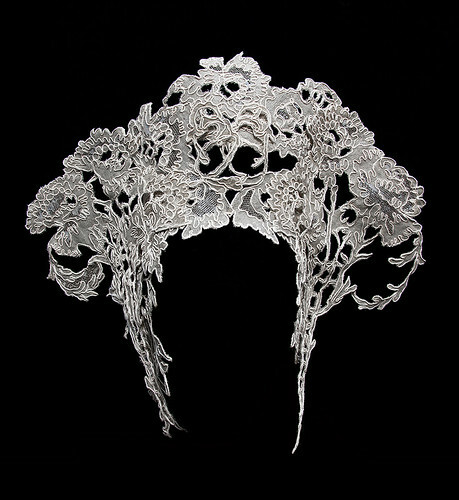 The embroidery was based on old art nouveau lace, which I hand drew and had embroidered onto fine silk. I then varnished them with endless layers to turn the material into a structural piece which I in turn formed the headdress from. It was deliberately linked with the design of the key, and was intended to blend with the organic forms of the tree roots and roses in the shrine. Maybe it was subconscious but the way the embroidery almost suggested carved bone was something I particularly loved and I felt made the Centurion more synonymous with the key and less human. 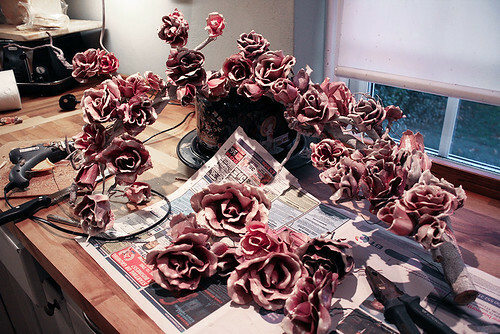 I equally loved the slow process of creating the set, for which I learnt a whole new skill using liquid plastic to coat my hand painted roses. My main inspiration were catholic roadside shrines, the concept of leaving something precious in the middle of nowhere was how I saw the Centurion and her key. 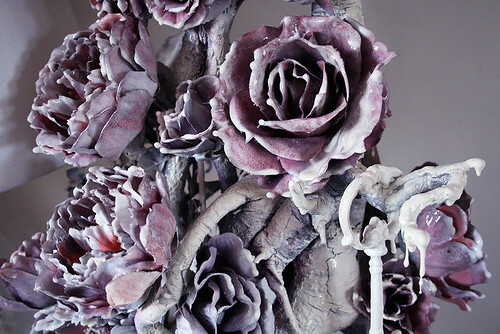 These figures are often made of wax surrounded by oval portholes of flowers with trinkets laid at their feet, so that was exactly how I translated my idea. It is strange that looking back through Wonderland I am constantly finding myself being influenced by religious iconography. I’m not sure if it is because of the extreme levels of surface decoration and ornament, or if it is something more subconscious. I guess I find absolute devotion fascinating and close to a belief in magic, which is maybe why it reoccurs so often in my work. The idea of these statues shedding tears as miracles was the reason why I decided to add one to the picture in post production. It is something I would never normally do, but I deliberately edited the model to look like a blank doll, with nothing but this one tiny shred of emotion, it was intended to hint at a trapped soul within. 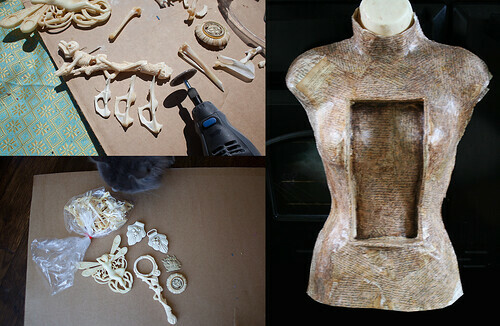 Creating the key from rabbit bones, and old decorative carvings and making the base for the costume bodice. Creating the shrine from painted tree roots, flowers, and liquid plastic to give the wax appearance was a long drawn out process, but it meant I now have a whole new skill and medium to play with in prop making! One of the details I’m most proud of, are the centurion’s rose petal nails. These took forever to make and were a real labour of love, but I’m so glad I pushed myself to create them. I find its details like this that always help to separate the models from being human, I’m always trying to submerge the characters into their environments and make them a part of their surroundings – rather than just placing a person in a set for a picture. So although you can barely see them looking at the image on a computer screen in real life as a 1 meter high print, they are an important part of believing in the reality of the character. 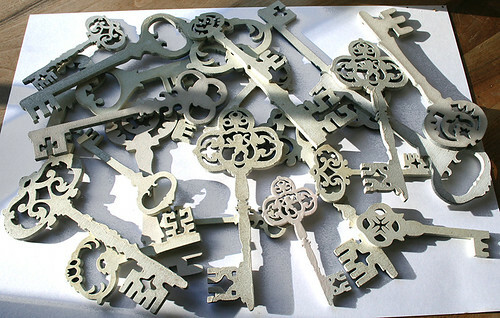 The small wooden keys I decorated the shrine with. This is awesome! Thank you so much for showing behind the scenes photos and in the making as well. Amazing! Your art is addictive! This is absolutely beautiful! It’s so interesting to see behind the scenes. You’re amazing – the amount of work and love you put into the production of your photography is incredible. How wonderful to revisit your blog and see the newest offerings. You are a star. I know your mom continues to be so incredibly proud of you! 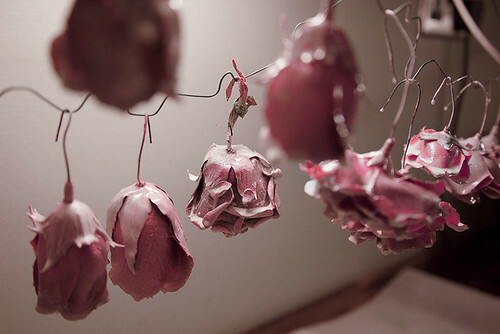 Thank you, as ever, for sharing your thoughts and giving us a peek inside your Gorgeous mind! Xo! Who really watches over the “Centurion”? For it feels to me she wasn’t always that way. Perhaps this dark duty of key guarding was given to her by one who cares not for her. As a guilt trip she performs the duty, but she seems fated for somewhere else, alas more importantly, by someone(s) else’s design. We are all created as the ultimate being to experience mortality and duty, but something in her face speaks of her greatness, while now hidden, must return. I just love to see your behind the scenes photos! Amazing work with so much incredible and stunning detail! Simply Gorgeous! I loved reading and looking at the process and was amazed at the finished products! Thank you!